Today’s posting includes the internal Soviet deliberations leading up to the summit, full transcripts of the two leaders’ discussions, the Soviet record of negotiations with top American diplomats, and other historic records being published for the first time. The documents show that the Soviet Union made significant changes to its initial position to accommodate the U.S. demands, beginning with “untying the package” of strategic arms, missile defense, and INF in February 1987 and then agreeing to eliminate its newly deployed OKA/SS-23 missiles, while pressing the U.S. leadership to agree on substantial reductions of strategic nuclear weapons. Gorbachev’s goal was to prepare and sign the START Treaty on the basis of 50 percent reductions of strategic offensive weapons in 1988 before the Reagan administration left office. In the course of negotiations, the Soviet Union also proposed cutting conventional forces in Europe by 25% and starting negotiations to eliminate chemical weapons. The documents also detail Gorbachev’s desire for genuine collaboration with the U.S. in resolving regional conflicts, especially the Iran-Iraq War, Afghanistan, the Middle East, and Nicaragua. However, the documents show that the U.S. side was unwilling and unable to pursue many of the Soviet initiatives at the time due to political struggles within the Reagan administration. Reading these documents one gets a visceral sense of missed opportunities for achieving even deeper cuts in nuclear arsenals, resolving regional conflicts, and ending the Cold War even earlier. The documents paint the fullest declassified portrait yet available of the Washington summit which ended 20 years ago today and centered on the signing of the Intermediate Nuclear Forces (INF) Treaty – the only treaty of its kind in actually eliminating an entire class of nuclear weapons. By eliminating mainly the missiles based in Europe, the treaty lowered the threat of nuclear war in Europe substantially and cleared the way for negotiations on tactical nuclear and chemical weapons, as well as negotiations on conventional forces in Europe. Under the Treaty, the Soviet Union destroyed 889 of its intermediate-range missiles and 957 shorter-range missiles, and the U.S. destroyed 677 and 169 respectively. These were the missiles with very short flight time to targets in the Soviet Union, which made them “most likely to spur escalation to general nuclear war from any local hostilities that might erupt.” (Note 1) These weapons were perceived as most threatening by the Soviet leadership, which is why the Soviet military supported the Treaty, even though there was a significant opposition among them to including the shorter-range weapons. The Treaty included remarkably extensive and intrusive verification inspection and monitoring arrangements, based on the “any time and place” proposal of March 1987, which was accepted by the Soviets to the Americans’ surprise; and the documents show that the Soviets were willing to go beyond the American position in the depth of verification regime. The new Soviet position on verification not only removed the hurdle that seemed insurmountable, but according to then-U.S. Ambassador to the USSR Jack Matlock, became a symbol of the new trust developing in U.S.-Soviet relations, which made the treaty and further progress on arms control possible. The documents published here for the first time give the reader a unique and never-previously-available opportunity to look into the process of internal deliberations on both sides and the negotiations both before and during the summit in December 1987. Record of Conversation of Chief of General Staff of the USSR Armed Forces Marshal of the Soviet Union S.F. Akhromeev and H. Brown, C. Vance, H. Kissinger, and D. Jones. This meeting takes place during the visit of the Council on Foreign Relations Group, to Moscow on February 2-6. In addition to meeting with Marshal Akhromeev, the members of the group also met with Mikhail Gorbachev and Alexander Yakovlev. Marshal Akhromeev discusses problems of U.S.-Soviet arms control process, which has slowed down considerably after the Reykjavik summit and criticizes the U.S. side for backtracking after the summit, especially on the issue of deep cuts in strategic offensive weapons. He expresses doubts that any progress could be achieved in the last two years of the Reagan administration in Geneva, but also emphasized the Soviet willingness to move ahead, however on the basis of “package,” i.e. linkage between INF, strategic offensive weapons and the ABM systems. Members of the Council on Foreign Relations Group express their disagreement with the idea of elimination of offensive ballistic missiles and total elimination of nuclear weapons proposed by Reagan in Reykjavik on the grounds of security, citing Soviet superiority in conventional weapons in Europe (Kissinger and Jones) and also arguing that if the agreement was reached, the U.S. Congress would have never ratified that agreement. The U.S. representatives suggest that further progress would be impossible on the basis of the Soviet “package” approach, and that to make it possible, negotiations should proceed on separate issues without linking them with each other. The conversation also involves detailed discussion of Soviet objections to SDI and the balance of conventional weapons in Europe, on which Akhromeev reminds the Americans of the Soviet proposal of June 1986 to reduce conventional weapons in Europe by 25%, to which they received no response. This long memorandum analyzes the statements and impressions of members of the group of the Council on Foreign Relations, which visited the Soviet Union earlier in the month, and provides recommendations for Gorbachev on next Soviet moves in arms control and Soviet-American relations. The document contains the single most powerful argument for “untying the package” of INF strategic offensive weapons and ABM systems, which was the basis of the Soviet arms control position in Reykjavik. Surprisingly, Yakovlev does not argue from positions of Soviet security or linkage to the SDI. His argument concerns mainly the domestic political situation in the United States, with right-wing forces running the show in the administration and the fact that the Irangate scandal has weakened President Reagan significantly. If the Soviet Union is to have any chance to achieve any arms control agreements in the next two years, before the end of the Reagan term, it needs major new initiatives, which would persuade the U.S. administration to engage in serious arms control. Therefore, the timing is ripe for untying the package to show the seriousness of Soviet intentions. He implies that the Soviet side must be ready to make concessions, but that they would not affect Soviet security. The second argument, which makes the timing even more important is that the resumption of Soviet nuclear testing (with the first test coming on February 26, 1987) would damage the image of Soviet perestroika in Europe. An announcement of a major new initiative such as untying the package would counteract the damage produced by the resumption of testing. This memorandum shows the impact of the visit of the representatives of the Council on Foreign relations on policymakers in the Soviet Union, and the attentiveness of the Soviet leaders to the perceptions of perestroika abroad. At this Politburo session the historic decision to “untie the package” is made ostensibly following the proposal by Gromyko (most likely the preliminary decision had already been made in the Walnut Room before the session started). Gorbachev argued strongly for this decision as the only way to jumpstart the negotiations that had been “stuck” in Geneva. Here he also proposes to invite George Shultz to Moscow, and to proceed to a quick conclusion of the agreement on INF and then on strategic offensive weapons. He shows his frustration with U.S. backtracking on arms control after Reykjavik. All present Politburo members speak in favor “untying the package,” including Yegor Ligachev and Defense Minister Yuri Sokolov, who later criticized the treaty and concessionary. Shevardnadze makes an argument about timing linking the decision to the need to restore trust in European public opinion after the resumption of Soviet nuclear tests. Gorbachev and Shevardnadze’s arguments follow very closely the argument presented in the Yakovlev memo of the day before (see Document 2). Memorandum of Conversation between M. S. Gorbachev and U.S. Secretary of State George Shultz. Excerpt. President Reagan’s deputy national security adviser Colin Powell forwarded a 10-page draft to Secretary of State Shultz and Secretary of Defense Weinberger on April 9, but the actual 2-page letter signed by President Reagan and carried by Shultz to Moscow, dated April 10, contained only a few phrases carried over from the draft. Especially notable is the muted language in the final letter about the then-raging espionage controversy over the U.S. Embassy’s Marine guards – which led to a U.S. Senate resolution urging Shultz not to go to Moscow, but ultimately proved to be based on coerced false confessions by the guards. The President downplayed the problems in his Los Angeles speech of April 10, when he said “If I had to characterize U.S.-Soviet relations in one word, it would be this: proceeding. No great cause for excitement; no great cause for alarm.” The same day, Gorbachev proposed to deal with the shorter-range INF issue by freezing and then cutting these systems. Gorbachev informs the Politburo about his conversation with Shultz. The surprising assessment is that “conversation was good but empty—we did not move anywhere.” He accuses Shultz as being focused on extracting concessions from the Soviet Union. Nothing is said of specific Soviet concessions on shorter-range nuclear missiles. Shevardnadze shares Gorbachev’s frustration with American abandonment of the Reykjavik position saying “the general tendency is hardening on all directions after Reykjavik—they want to keep 100 units and are against the global zero. However, Gorbachev makes it very clear that the treaty and more radical progress on arms control are in Soviet interests and that he would continue to press the American leaders in this direction. Between M.S. Gorbachev and the President of the United States R. Reagan before the first trip to Washington. May 1987. In this draft Gorbachev outlines his ideas for the first one-on-one conversation he will have with Reagan. He is coming with a very ambitious agenda—not limited to the INF treaty but in fact looking far beyond it. In the very first conversation, he is prepared to engage Reagan on START, chemical weapons, conventional weapons and regional problems. The scope of issues mentioned in this draft and the solutions proposed on each of them show what a monumental opportunity the summit could be with the Soviet leadership willing to be flexible on practically all the issues that before represented stumbling blocks not only in U.S.-Soviet arms control negotiations but in resolving regional conflicts such as the Middle East, Afghanistan, Iran-Iraq war and the situation in Central America. Gorbachev shows unbendable optimism in his and Reagan’s ability to deal with all these issues decisively and successfully. This directive signed by President Reagan two days after the beginning of the eighth round of the Nuclear and Space Talks (NST) in Geneva provided specific instructions for each of the three U.S. negotiating teams. The INF instructions in particular represented a holding pattern (“Washington is currently examining the Soviet proposal”) on the issue of shorter-range missiles (SRINF), even though both Gorbachev and Shultz at different points in the April discussions had embraced the idea of a “double zero” for these missiles. In other respects, the instructions moved backward from the Reykjavik summit positions, with a seven-year as opposed to a ten-year period for non-withdrawal from the ABM Treaty, and resurrection of the “sublimits” approach to counting nuclear weapons. This directive essentially codified the “double zero” agreement announced formally the previous day at the semiannual NATO ministerial meeting, after a period of heated debate among NATO leaders, with West Germany’s Kohl most in favor of the approach and Britain’s Thatcher most dubious. But the document’s second paragraph ends with what would become the sticking point to the negotiations – the status of the Pershing missiles belonging to West Germany. Ultimately, after what President Reagan described in his memoirs as his own private plea to Kohl, the West German leader would announce on August 26 that the German Pershings would be eliminated once the U.S. and Soviet missiles were. These State Department briefing papers provide a snapshot of U.S. negotiating positions across the range of U.S.-Soviet issues going into the fall discussions that would produce the INF Treaty and the Washington summit. From internal evidence (repeated references to “as of August 11”), the typed text appears to date from August 11, but the handwritten notes and editing comments were added subsequent to Chancellor Kohl’s August 26 offer to eliminate the German Pershings. Written by National Security Council staff, this memorandum bears the codeword GRIP signifying the particular secrecy compartment used for NSC documents on U.S.-Soviet arms discussions in 1987 and 1988 (there would ultimately be at least 96 separate GRIP items, according to the finding aide to the Robert Linhard Papers at the Ronald Reagan Presidential Library). The issue of U.S. warheads on the German Pershings came up in June 1987 when the U.S. Defense Department responded to the “double zero” consensus by proposing the conversion of Pershing IIs into shorter range Pe-1Bs for turnover to the West Germans, much to the Soviets’ dismay. Even after Kohl’s August 26 announcement on elimination of the German Pershings, the Soviets suspected backsliding when the U.S. would not commit in writing to destroy the Pershing warheads; but this memo outlined the position that the U.S. would take: sticking to the principle of not negotiating about an ally’s weapons, while reassuring the Soviets that the warheads would not be used in some other configuration. This briefing memo and attached talking points were drafted by NSC staffers Linton Brooks and Will Tobey and forwarded by the national security adviser, Frank Carlucci, to President Reagan to prepare him for a key NSPG meeting on the upcoming visit by Soviet foreign minister Shevardnadze to Washington. Although the memo suggests there would be a debate over how flexible the U.S. negotiating positions should be on START and SDI, the outcome of the NSPG meeting was that President Reagan sided with defense secretary Weinberger against any change in those positions (Weinberger had separately argued for keeping some non-nuclear-tipped INF missiles, but Reagan overruled him). Foreign minister Shevardnadze arrives in Washington on September 15 bearing this five-page letter from Gorbachev to Reagan (8 pages in the unofficial translation given to the President). Together with a plea for progress on INF and arms reductions generally, the letter contains an interesting distinction related to the issue that had derailed the Reykjavik summit, the Strategic Defense Initiative. Gorbachev refers to “strategic offensive weapons in space” as the problem for the Soviets – the fear that U.S. development of the SDI would create the capacity for a Hitler-style blitzkrieg from space. Reagan had always insisted the U.S. was not seeking this capacity, but as Raymond Garthoff has noted, the President missed the opening to combine constraints on such weapons with the cooperative SDI program he always envisioned with the Soviets. The Shultz-Shevardnadze talks during this visit ultimately produce only an agreement in principle on the INF Treaty and on a subsequent summit in Washington with a date to be determined later. Memorandum of conversation between M. S. Gorbachev and U.S. Secretary of State G. Shultz. Excerpt. In this long and fascinating conversation Gorbachev was trying to show the new Soviet flexibility to move closer to the U.S. position on the issues of sub-ceilings on elements of the strategic triad, including willingness to have a lower level of Soviet heavy ICBMs, laboratory testing of SDI elements, and verification. At the same time, he notes that the U.S. side tries to “squeeze as much as possible out of us.” Gorbachev’s main objective for the meeting is to get Shultz to agree to draft key provisions for the START treaty that could be discussed in Washington during his visit. However, Shultz’s response to this proposal is inconclusive—he would prefer delegations in Geneva to work more on clarifying the issues under dispute and leave the “key provisions” for the principals to discuss at the summit. Gorbachev vents his frustration calling Shultz’ position “foggy, “ complains about U.S. lack of willingness to move on arms control, and doubts U.S. support for Soviet domestic changes. No decisions on “key provisions” were achieved and even dates of the summit were left undecided. The document also contains a fascinating discussion of U.S.-Soviet collaboration in trying to resolve the Iran-Iraq conflict. This letter is Gorbachev’s final call for progress in discussions of the key provisions of START treaty so that the principals could agree on those in Washington. The last obstacle to such agreement is the period of non-withdrawal from the ABM Treaty, which the Soviet Union proposed to be ten years and to which Shultz did not agree in Moscow. Gorbachev proposes to open a direct channel through the Ambassadors to discuss this issue before the summit to find a speedy solution. Gorbachev believes that it is realistic to achieve an agreement on strategic weapons and to start discussion on banning chemical weapons. He suggests that “we want to crown your visit to the Soviet Union with concluding an agreement on strategic offensive weapons” referring to the planned Reagan visit to Moscow in May-June 1988. In the letter, Gorbachev also gives final dates of his visit to Washington—during the first ten days of December 1987. The Secretary of State summarizes for the President the contents of Gorbachev’s “fairly positive” letter, which would be hand delivered to Reagan by Shevardnadze later that day. Shultz remarks on the Soviet agreement for an early December summit in Washington, and notes the flexibility in various of Gorbachev’s proposals. 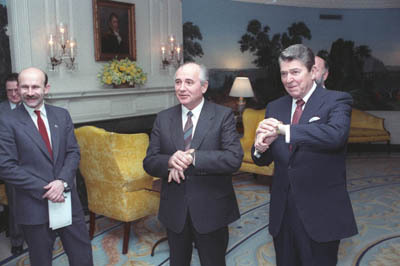 After formally receiving the letter from Shevardnadze, Reagan would announce the summit agreement in the White House press room, with Shultz and Shevardnadze at his side. This directive written in the first person summarizes President Reagan’s expectations for the Washington summit, and perhaps most strikingly asserts that the summit “must in no way complicate our efforts to maintain a strong defense budget and key programs like SDI” and the Reagan doctrine support to anticommunist armed forces abroad. Frances Fitzgerald commented in her book Way Out There in the Blue (p. 434) that “Both of these policies were history in the Hollywood sense of the word, yet administration officials followed the guidance quite faithfully” to the point of missing Gorbachev’s offer on Central America for both the U.S. and the USSR to stop shipping arms there if the peace plan proposed by Costa Rica’s Oscar Arias was accepted. Since the U.S. Congress was not going to approve more arms anyway, given the Iran-contra scandal, Gorbachev’s offer amounted to exactly the cessation of Soviet arms that the U.S. claimed it sought. On the eve of the Washington summit, the top U.S. intelligence analyst on the Soviet Union – Robert M. Gates, then the deputy director of CIA – gets Gorbachev almost completely wrong. In this memo (forwarded by the CIA director William Webster to Vice President Bush and other top officials), Gates predicts that the Soviet reforms are merely a “breathing space” before the resumption of the “further increase in Soviet military power and political influence.” Gates misses the Soviet recognition that the Stalinist economic system had failed; he incorrectly predicts that Gorbachev will only agree to arms reductions that “protect existing Soviet advantages”; he claims the Soviets are still committed to the protection of their Third World clients – only three months later, Gorbachev would announce the pullout from Afghanistan; and Gates sees any Gorbachev force reductions as a threat to “Alliance cohesion” rather than a gain for security in Europe. This hard-line assessment of Gorbachev is not shared by President Reagan, who would rescind his “evil empire” rhetoric while standing in Red Square in May 1988. This two-page cover memo from the head of the State Department’s intelligence and research bureau to Secretary Shultz summarizes a seven-page INR study looking at “what might be some of the ‘wild cards’ on the summit agenda.” While generally accurate in its assessment of Gorbachev’s intentions, even the State Department analysts closest to the Shultz view of Soviet behavior do not predict several of the Gorbachev surprises during the summit such as the offer on Central America and on conventional forces in Europe. The prediction of “something splashy on Afghanistan” would be off by a few months, but the memo’s anticipation of a possible SDI compromise would be only slightly behind Gorbachev’s own thinking. On the Friday before the Washington summit, President Reagan signs this directive setting out what journalist Don Oberdorfer later described as “seemingly impossible” negotiating goals on SDI with Gorbachev, including explicit Soviet approval of tests in space, and Soviet approval of US deployment of strategic defenses after the end of an agreed period of non-withdrawal from ABM Treaty. Gorbachev had rejected both of these ideas repeatedly in earlier meetings, but would surprise the Americans at the Washington summit with his tactics if not his underlying posture on SDI. Memo of Conversation between President Reagan and General Secretary Gorbachev, 10:45 a.m. – 12:30 p.m. Memo of Conversation between President Reagan and General Secretary Gorbachev, 2:30 p.m. – 3:15 p.m. In the first conversations of military experts Marshal Akhromeev outlines the Soviet position on the strategic nuclear weapons negotiations. The main point remained the linkage between ABM compliance and START issues. The other remaining issue is verification, on which now Soviets were prepared to go further than the Americans in reversal of the traditional positions. When Akhromeev offers on-site inspections to count the number of bombs deployed on each bomber, Nitze responds: “We cannot agree to that.” The discussion also covers issues of counting Soviet “Backfire” bomber and U.S. sea-launched cruise missiles. Memo of Conversation between President Reagan and General Secretary Gorbachev, 10:35 a.m. – 10:45 a.m. Draft Memo of Conversation between President Reagan and General Secretary Gorbachev, 10:55 a.m. – 12:35 p.m.
Record of Conversations between Sergey Fyodorovich Akhromeev and Paul Nitze at the U.S. State Department. Excerpt. Akhromeev and Carlucci discuss issues of possible cooperation on SDI research during the period of non-withdrawal and non-deployment of SDI systems. Carlucci makes a very strong argument in defense of the SDI saying that it is widely supported in the country and that there was no chance for a strategic offensive weapons treaty to be ratified by the U.S. Congress “regardless of how great it was if only it was said that it undermined the concept of SDI.” Akhromeev counters with questioning the SDI feasibility and suggesting that the Soviet Union was capable of producing an asymmetrical response to the program. 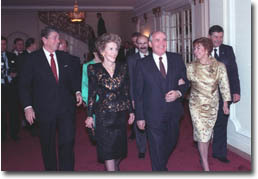 Draft Memo of Conversation between President Reagan and General Secretary Gorbachev, 10 a.m. – 12 p.m.
Akhromeev and members of U.S. JCS discuss measures of cooperation between representatives of U.S. and Soviet armed forces as means of building trust between the two militaries. Akhromeev proposes more human contacts between the officers, visits to bases, exchanges of basketball teams or military bands. The conversation also involves the issues of reductions of conventional weapons in Europe, including dual-use weapons. During the discussion of conventional weapons Akhromeev for the first time admits that there are “imbalances” in the European theater, including the Soviet advantage in tanks and U.S. advantage in combat aircraft. Verification and nuclear safety centers are also discussed. Anatoly Chernyaev Memorandum to Gorbachev. In this memorandum prepared for Gorbachev’s report to the Politburo on the results of the Washington summit Chernyaev lists all the accomplishments of the summit—primarily in dealing with negotiations on strategic nuclear weapons. According to Chernyaev, there was a real danger that the summit results would have been limited to the INF treaty without progress on START issues. He notes progress in finding solutions to the following difficult issues: provision on compliance with the AMB treaty, limits for warheads on strategic missiles and for warheads on sea-launched cruise missiles. Chernyaev also discusses Reagan’s negotiating style “his incompetence,” pointing that the real power “rests with the group of Bush, Carlucci and others around him”—but Gorbachev decides not to use this part of memo in his actual Politburo presentation and spoke about Reagan very favorably in his report on December 17. At this Politburo session devoted to the results of Gorbachev’s visit to Washington, Gorbachev gives a very high assessment of the summit and the INF treaty. He considers the Washington summit as “bigger than Geneva or Reykjavik” in terms of building mutual understanding with the U.S. leadership. 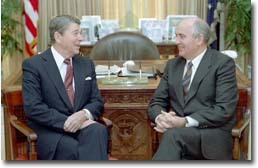 He notes the change in Reagan’s behavior and emphasizes that the principals were speaking “as equals and seriously each keeping his ideology to himself.” Gorbachev stresses the historic nature of the INF treaty and the full Politburo support for it, because “the entire development of Soviet-American relations and the normalization of international situation in general” depended on the outcome of this issue. He also informs members of the Politburo about his and the delegation’s meetings with Americans of all ways of life and describes strong support for perestroika in the United States. This directive signed by President Reagan sets up the White House teams working for Senate ratification of the INF Treaty. This was not a hard sell politically: On December 15th the Washington Post published the first post-summit poll, showing Reagan’s approval ratings at their highest since the Iran-contra scandal broke in November 1986, up from 50 to 58%, with 61% having a “favorable impression” of Reagan. Remarkably, 65% had a “favorable impression” of Gorbachev! Yet a chorus of critics (including former President Nixon, former secretary of state Kissinger, and former – and future – national security adviser Scowcroft) were attacking the INF treaty for removing nuclear weapons from Europe while leaving a large Soviet conventional arms advantage. Unbeknownst to the critics, in part because Reagan was unprepared to take up the conventional forces issue when Gorbachev raised it during the summit, the Soviets were ready to move on major cuts in non-nuclear forces as well, and Gorbachev would announce such cuts in his United Nations speech less than a year later. 1. Raymond Garthoff, The Great Transition: American-Soviet Relations and the End of the Cold War. (The Brookings Institution: Washington, D.C. 1994), p. 327.